Was a wrong ‘foot movement’ the reason Anderson Silva lost his title? 'The Spider' says a 'basic mistake' was to blame for his Weidman loss. It’s hard to imagine a champion as great as Anderson Silva being made to look human, but that’s what Chris Weidman did when he knocked out the legendary fighter at UFC 162 to become the new UFC middleweight king. Following the fight there were a million questions floating around about why it happened, but at the front of the line was Silva’s taunting – a tactic he’s used to perfection in a ton of his previous fights, but this time it backfired in a big way. Well, as it turns out Silva is finally speaking out about the reason he lost the fight to Weidman and he believes it had nothing to do with the actual taunting or game playing that was going on inside the Octagon. It came down to his footwork and a counterpunch that he should have thrown when Weidman engaged. If not for that one mistake, Silva believes he’d still be holding onto his title right now. "My mistakes in that fight, and that’s the first time I’m saying this, were basic mistakes," Silva told SporTV in Brazil. "I did everything I had to do except hit him. I didn’t counterattack. When I stopped with my feet parallel, I should have hit him and walked one step behind. I didn’t do that. I saw my mistakes and I’m working on that to train for this next fight." On Wednesday night, UFC president Dana White appeared on FOX Sports Live where he was asked the same question by Chael Sonnen – did Silva really lose due to basic mistakes or is this just some kind of excuse? "I talked to him at length about it, and so basically his foot was in the wrong position," White explained. "Had his foot been in a different position that would have never happened. 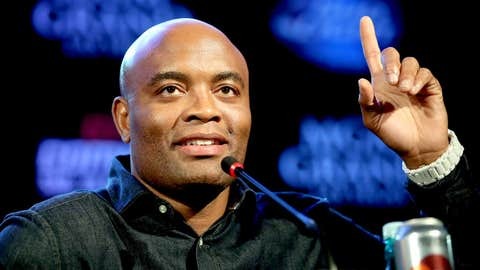 I mean how do you question Anderson Silva? The guy’s a master. When I stopped with my feet parallel, I should have hit him and walked one step behind. "He loses one fight, the critics start diving in and ripping him apart like they know what the hell they’re talking about. Look at what the guy’s accomplished in his career. Maybe it was one little foot movement. We’ll find out on December 28." Weidman might argue that his fist crushing Silva’s jaw had more to do with the fight ending than Silva’s foot movement, but he’ll likely try to prove it was no fluke when they face each other again in just a few weeks. Silva will look to redeem himself after losing for the first time during his seven year UFC career where he had 10 straight title defenses and the longest winning streak in promotional history. He will attempt to start another one on December 28.